Pressure cook potatoes with skin and then peel it and dice into cubes. Cook peas separately. Cut onions into one inch long pieces. Now fry mint leaves in a tsp of oil and then grind it along with coconut, green chillies, ginger and turmeric powder into a smooth paste by adding some water to it. Heat 2 tsp of ghee or oil in a broad frying pan and fry cloves, cardamom and bay leaf. Now add the onion and fry till golden brown. Add the ground paste along with potatoes and peas. Stir constantly in medium flame till the raw smell goes. Add salt and the rice to it and mix well till the rice becomes steaming hot. Finally remove from stove and add the lemon juice to it and mix it gently. This quantity will suffice for three people. Dear Nithya, congrats on ur new domain, I hope I am not too late to wish u for that. 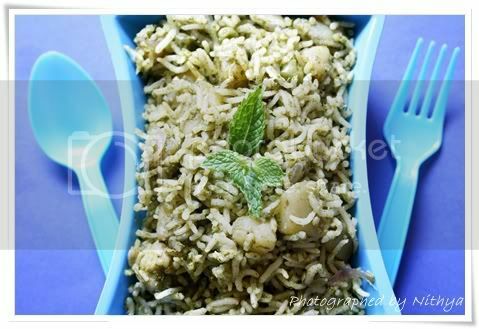 I love the mint pulao and I love eating this with some onion raita, so very aroamtic and flavourful. Great presentation and delicious aromatic rice..I too make this often..
Wow... Gr8 recipe.. i love pudina rice.. looks soo delicious and aromatic.. very tempting clicks dear!.. Awesome job!! 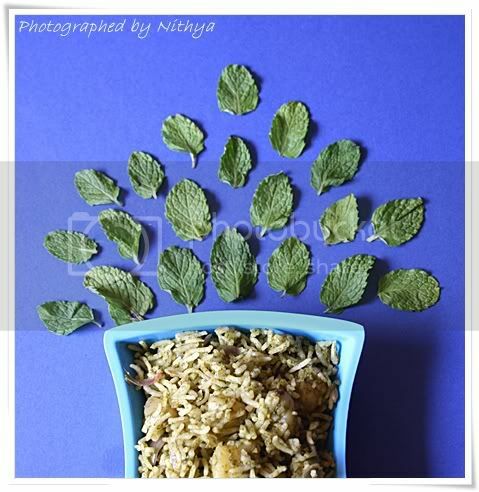 Just had coriander pulao with potato chips, mint pulav makes me drool..
Yummy pulav Which I always make. Delicious aromatic rice. Lovely presentation, luv mint pulav v much! Looks great Nithya - one of my favorite mixed rice - I make this atleast once in 2 weeks for lunch or dinner. This is my all time favorite !! 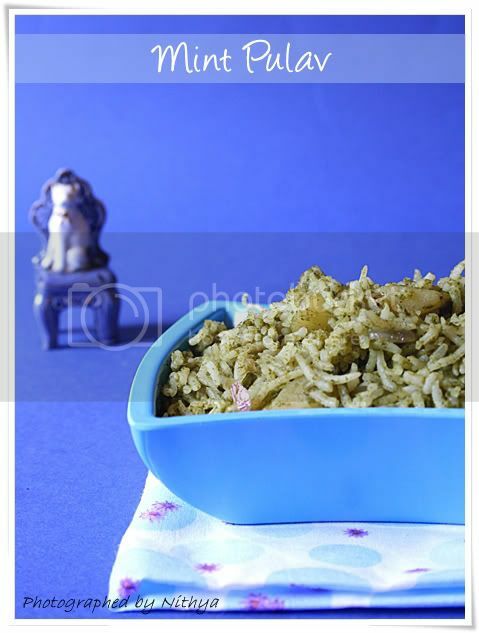 Beautiful clicks dear...Yummy and aromatic pulav..
wow....u make me drool here! nice authentic and tempting and delicious. 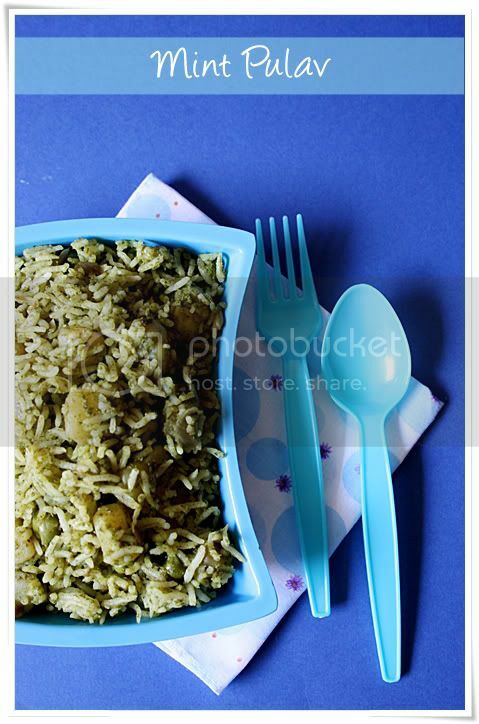 OHh yaa surely going to try tomm for my hubby's lunch box ...this looks awsome ...without adding coconut also can we do va nithya....thanx for sharing dear ...Excellent & Amazing clicks..
Love the last picture a lot girl,superb :) And I have tried a similar one from Mallika badhrinath ,Love it! looks very very resfreshing...best coolant of stomach in hot summer afternoons and then have a good nap !!!!!!! I have got loads of Mint Leaves lying in my refrigerator, and they wanna be used the way Nithya uses in Mint Pulav :) Bookmarked will try soon ! nice pulao, I love mint. I absolutely love mint too. And Pudina pulao is one of my fav pulaos. yours looks great. Nice n healthy recipe , Great for hot summer months . Thats a delectable n flavorful rice nithya.Nice presentation. 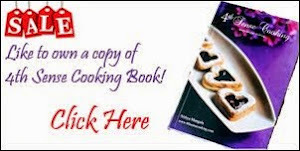 Wonderful recipe and wonderful photos!!! Checking out your other posts! This is very tempting. Loved it...beautiful click ! Delicious aromatic pulao. Great presentation Nithya!!! nice pictures, I liked the use of blue color. Hi Nitya. I am visitng ur blog for the first time. Your blog is eye-catchy and interesting. I spent a good amount of time today reading ur posts, recipes and good photographs. Keep up the good work. a good chef cooks partly with his nose :-) guessing the food was my favorite game too! and i love the smell of roasting garlic in ghee ! !